• verre optique de qualité professionnelle de Hoya. Ces filtres propose unemonture fine en aluminium léger. • Rotation douce. • Elimine les reflex sauf les reflex métalliques. Vernis spécial noir mat recouvrant la bague, constitue une protection efficace contre des rayons parasites dus aux réflexions. Hoya - YSCPL052. Hoya YSCPL052. Taille de filtre: 5,2 cm, Couleur: Noir. - Taille de filtre : 5,2 cm. - Type de filtre : Polarisation circulaire. - Toutes nos expéditions sont suivies (Lettre suivi, colissimo suivi ou transporteur) et bien protégées. Filtre Polarisant Circulaire HOYA PRO 1 DIGITAL 52 mm Monture et bord du filtre traité noir mat. Filtre traité multi-couches. Diamètre 52 mm. Kit composé d'un filtre UV (c), un filtre polarisant circulaire digital, un filtre gris neutre ND8 et housse. Le filtre polarisant intervient sur les reflets à l'exception de surfaces métaliques. HOYA Filtre HD. La révolution des filtres HOYA -. Un angle de caméra de 30 degrés de la surface réfléchissante (verre, eau, etc.) est idéal pour un effet maximum. Filtres polarisants Hoya n’affectent pas l’équilibre global de la couleur d’un coup. Accessoires filtre. Un angle de caméra de 30 degrés par rapport à la surface réfléchissante (verre, eau, etc) est idéal pour un effet maximum. 1x HMC numérique UV (C) Filtre. HMC numérique UV (C) Filtre. CIRCULAIRE Filtre polarisant. Hoya PL polariseur linéaire filtre 52mm. Hoya filtres polarisants n'affectent l'équilibre des couleurs. Hoya 52mm filtre polarisant circulaire Pro-1 Digital. Filtre polarisant pour le contraste des couleurs et mise en valeur sans affecter l’équilibre général de couleur. Circular Size 52mm. MPN 52S PRO1D PL-CIR. Hoya polarisant circulaire 52 mm filtre PL-CIR armature mince. La Hoya Polarisant Circulaire. HOYA < span class = « notranslate » > cadre SLIM CIR-PL. Marke Hoya. Zwischenverkauf vorbehalten! D = Gebraucht, stark abgegriffen mit kleinen Fehlern aber funktionsfähig / Used, heavily tapped with small mistakes but functional. Filtre en excellent état, 2 utilisations. HOYA SUPER QUALITY FILTER CIR-POLARIZING 52MM. Envoi rapide et soigné. Polarisant circulaire Slim filtre de 52mm Hoya. Les rayons lumineux qui sont reflétées sont polarisent. Filtres polarisants servent à sélectionner les rayons de lumière entrer votre lentille de la caméra. 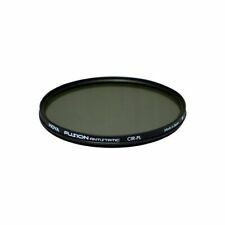 Hoya CPL Filter-Filtre 52 mm Description Light rays which are reflected by any surface can become polarised so polarising filters are used to select which light rays enter your camera lens. CIR-PL filters allow you to remove unwanted reflections from non-metallic surfaces such as water, glass etc. They also enable colors to become more saturated and appear clearer with better contrast. This effect is often used to increase the contrast and saturation in blue skies and white clouds. This effect is often used to increase the contrast and saturation in blue skies and white clouds. Kenko's CPL filter do not affect the overall colour balance of a shot. The glass of the Clear PRO filter also has UV absorbing properties making the Clear PRO a combination CPL and UV filter. This effect is often used to increase the contrast and saturation in blue skies and white clouds. Circular Polarising Filter. 1x Circular Polarising Filter. The Hoya HMC Digital UV(C) Filter is a multi-purpose fine-weather filter that absorbs the ultraviolet rays which often makes outdoor photographs hazy and indistinct. Un angle de caméra de 30 degrés par rapport à la surface réfléchissante (verre, eau, etc.) est idéal pour un effet maximum. filtres polarisant Hoya n'affectent l'équilibre des couleurs d'ensemble d'un coup de feu. Hoya Fusion Antistatic Circular Polarising Filter features Hoya’s Professional-grade optical glass. A high-transmission filter made with professional-grade optical glass, in a slim, smooth-rotating mount. Digital multi-coated filters greatly reduce the appearance of lens flare and ghosting caused by reflections. We will always help you to have a 100% positive happy buying experience. Hoya 52mm Pro1 Digital Circular Polarizing Filter. ♢ Circular Polarizer. Circular Size : 52mm. This increases color saturation, bringing better clarity and contrast while leaving the overall color balance unaffected. Professional-Grade Hoya Optical Glass. Circular & Threaded Filters. Filter Accessories. A high-transmission filter made with professional-grade optical glass, in a slim, smooth-rotating mount. Super-Slim filter ring to avoid vignetting on super wide-angle lenses. • This is a linear polariser. For these you require a circular polariser. This effect is often used to increase the contrast and saturation in blue skies and white clouds. HOYA's polarising filters do not affect the overall colour balance of a shot. Hoya 52mm circular polarising filter. Condition is Used. Good condition in original case. These are new 52mm HD Circular Polarizing Filters. Specialized coatings that are not just water-proof to repel water spots but also hardened to be scratch and stain resistant. Of course these coatings are from HOYA so they are greatly reduce reflections off the surface of the glass allowing you to capture more light in your photos. Hoya 52mm Slim Circular Polariser Filter. Professional quality polarizing filter from market leader Hoya. Enhances the colours of your photographs and removes unwanted reflections. Does not affect autofocus operation. 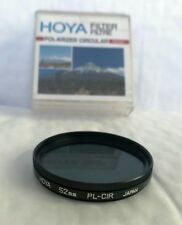 Hoya 52mm Extra_Thin Circular Polarizer Super Multi Coated Glass Filter is a lightweight and durable filter which is ideal for wide angle zoom lenses. This effect is often used to increase the contrast and saturation in blue skies and white clouds or deep blue beach. These are new 52mm Hoya PRO 1 DMC Circular Polarizing filters. (DMC Stands for Digtal Multi Coated). Filters are Digital Multi Coated on both the front and rear glass surfaces. This effect is ideally suited to landscape photographers and is often used to increase the contrast and saturation in blue skies and white clouds. This is a brilliant high quality filter kit which includes one Kenko 52mm UV Smart Multi-Coated and one Kenko Circular Polarising. FUNCTIONS OF THIS KENKO CIRCULAR POLARISING (CIR PL) FILTER. FUNCTIONS OF THIS KENKO UV MC FILTER. Hoya 52mm HD Circular Polarizing Filter. 25% Greater Light Transmission than Standard Polarizing Film. ♢ Circular Polarizer. Circular Size : 52mm. This increases color saturation, bringing better clarity and contrast while leaving the overall color balance unaffected. Je dirais qu’il à 9 sur l’échelle de 1 à 10. Il est propre et je ne vois pas les égratignures. Square/Rectangular Size 52mm. Circular Size 52mm. Model Vario PL-Color. The Hoya filter is an essential accessory for capturing nature, travelling, landscape and marine and outdoor photography. The effect can be seen through the viewfinder and changed by rotating the filter. The glass of the HOYA HRT filter also has UV absorbing properties making the HRT a combination UV/circular polarizing filter. The HOYA HRT circular polarizer filter transmits as much as 25% more light through the polarizing film giving the photographer about 1/3 stop more light than a standard circular polarizer. The effect can be seen through the viewfinder and changed by rotating the filter. This effect is often used to increase the contrast and saturation in blue skies and white clouds. HOYA's polarising filters do not affect the overall colour balance of a shot. This effect is often used to increase the contrast and saturation in blue skies and white clouds. HOYA's polarising filters do not affect the overall colour balance of a shot. This Hoya Pro1 Digital kit includes a UV and Circular Polarising Filter.